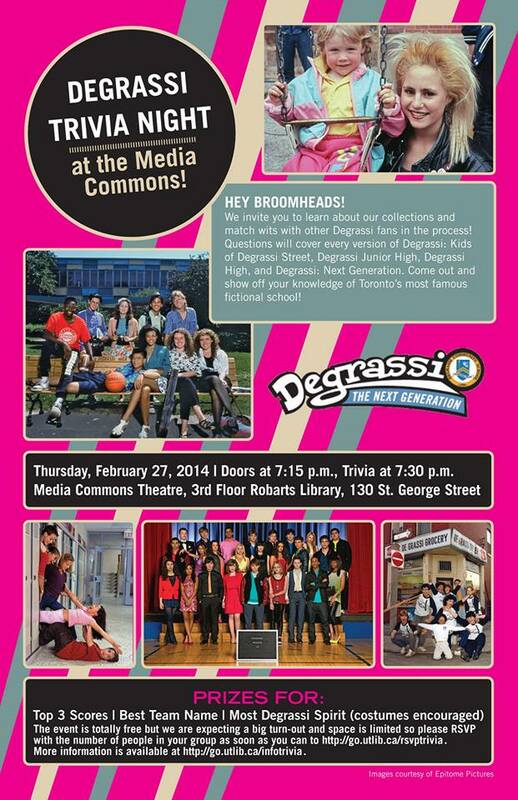 The University of Toronto will be hosting a “Degrassi Trivia Night” at the Media Commons Theatre on Thursday, February 27th at 7:30pm. Trivia will consists of questions spanning the entire Degrassi franchise, from Kids of Degrassi Street to the current incarnation. The event is free and I’m assuming it’s open to everyone of any age since I can’t find anything in terms of age restrictions. They’ll be giving out prizes for various things (like the trivia team with the best name), but the first place prize is a big one: a visit to the set of Degrassi. That’s seems to be a rarity nowadays and this is a fairly easy way to win it, so if you have the chance to make it go for it!